Blowout Sale! 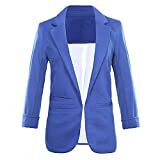 Up to 57% off on Blazers & Jackets at Felicianeo. Top brands include Woman Within, HyBrid & Company, Auliné Collection, Lrud, Ellos, Chicwe, Kasper, Zeagoo, Nine West, Calvin Klein, Jessica London, Dealwell, & Plus4u. Hurry! Limited time offers. Offers valid only while supplies last.